Rebel Legion :: View topic - Hello from a Rey! 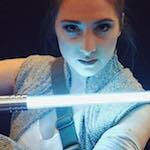 Posted: Sun Jan 28, 2018 4:56 pm Post subject: Hello from a Rey! Hey there! I just received my official acceptance e-mail this morning and I can't wait to serve with y'all! Congratulations and welcome to the Rebel Legion and Corellian Base. Welcome, Britt. Congrats on your approval!